Fazio Law Office is dedicated to bringing you high quality legal services. In practice for over 24 years Frank’s goal is to provide clear and decisive advice. You should leave our office with a complete understanding in everyday English of all of your legal dealings and to that end we have assembled the best legal staff to assist in your needs. Nancy Warren has been with Fazio Law for 19 years and has a wealth of Real Estate and Corporate experience having previously spent 14 years in Toronto in this capacity. Rachel Abram has been with Fazio Law for 10 years and is experienced in Real Estate, Wills and Estate Drafting. She previously worked for Teranet, Ontario’s Electronic Land Registry System, with legal title integration projects. Susan Stubbs has been with Fazio Law for 1 year and is experienced in Real Estate Law. Prior to joining my practice, Susan worked for 7 years at another law firm in the Real Estate department; 3 years as a title searcher; and 22 years at CIBC Head Office in Toronto. Karissa Lubbers graduated from the University of Guelph with a general bachelor’s degree. She then continued her education at Lambton College, graduating from the Law Clerk program in the Spring of 2015 and has since been hired on full-time at Fazio Law. Frank was called to the Bar of Ontario in 1988 and has since served on several boards in Sarnia-Lambton including The YMCA, The Downtown Business Improvement Area, The Lung Association, The Real Estate section of the Lambton Law Association, to name a few. Frank also shares his passion for soccer having coached dozens of houseleague and travel teams for 16 years. 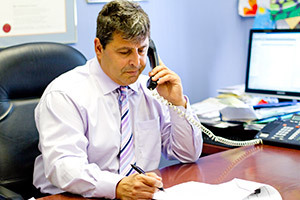 With long time roots in the Sarnia area in the real estate development and construction fields, Frank is uniquely qualified to handled your legal needs. Copyright © 2019 Fazio Law – Sarnia and Lambton Law Firm.